The above quotations are all taken from different t authors writing on Indian philosophy in various issues of a journal called Philosophical Quarterly. The bewildering style in them is unmistakable. They indicate by and large the usual tenor of a host of modern interpreters of Indian philosophy. This is more or les the general trend among our philosophers who strenuously justify the tenets of philosophical idealism to the struggling millions of the contemporary epoch, unmindful of the implications of the doctrine to the life of these teeming millions who work for their livelihood unlike those who lead parasitical lives. The reactionary content of the doctrine is many times sought to be submerged in a brilliant pool of seemingly astounding qualities of clarify, perfection, and invincible logic. The blatantly a-historical method followed by them is never an embarrassment to them, as in their case it might truly be said that the end justified the means. The unexpressed end, of course, is the perpetuation of the socioeconomic status quo. The partial mutilation of the Indian philosophical texts that they unhesitatingly resort to, the aversion to a scientific analysis of the texts by placing them in their proper historical perspective, and the totally baffling formulation that they arrive at, apparently reflecting the view adumbrated in the texts, are only some of the unfortunate and incorrect practices of these diehard conservative traditionalist in the sphere of Indian philosophy. Debiprasad Chattopadhyaya is as different from them as ivory is from jet. He is always cool, refreshing, invigorating and pulsating with analyses and deductions which make one confident of the strength of one’s traditions, and approach to struggles. His earlier works like Lokayata, Popular Introduction to Indian Philosophy, Indian Atheism and numerous articles on a variety of topics have been an incontrovertible testimony to this. The present work[i] establishes this claim even more authentically and vividly by laying bare the truth about Indian philosophy and its traditions through copious textual references which are analyzed and discussed with the utmost competence. The best thing about the book is that it is pleasantly free from any vague and romantic panegyrics to Indian philosophy for its own sake and that no statement goes unsubstantiated. The whole book is a pointer to the fact that no inflated claims regarding Indian philosophy are valid unnecessary and that there is enough positive content in it to enthuse us. Armed with the most magnificent and scientific methodology that we know of, namely Marxism, Debiprasad Chattopadhyaya unravels before us in the book both the diabolical and the dynamic in Indian philosophy and thereby performs a unique and yeoman service to the inheritors of that philosophy facing new challenges today. The book does not purport to be an academic exercise merely and the author in his Preface pronounces the purpose, which in turn prescribes the procedure adopted. It is “an analysis of our philosophical traditions from the standpoint of our present philosophical requirements. These requirements, as understood there, are secularism, rationalism and science-orientation.” The role of philosophy in the past and present needs to be clearly grasped for understanding the task the author has chosen to perform. “Blessed-are-the-poor-for-theirs-is-the-kingdom-of-heaven” philosophy has through the centuries preached that mortal man must abandon mundane pursuits and pleasures and turn heavenward, for there is bliss and fulfillment in that alone. To shun the here and to glorify the hereafter is one sure way of imposing shackles on the working and struggling people. In the name of ultimate emancipation, the people are made perpetual slaves to some abhorring ideas; and they ensure the willing physical slavery of the oppressed, much to the relief and joy of the ruling classes. A dangerous reactionary idea, as much as a vigorous progressive idea, becomes a material force when it grips the minds of the people. One is an impediment to progress, while the other is an instrument of progress. Idealist philosophy, proclaims to understand the world (or reality) and emancipate the people, does neither ultimately, and becomes a millstone round the neck of man. In the evolution of society, therefore, there is a specific point of time when both philosophy and science as the redeemers of making as a whole are denied. That is the stage where the working hand has receded and the thinking mind has come forward, with the result that the philosophy beneficial to the working man is undermined and the philosophy supporting the ruling class is branded the all-embracing philosophy. As Benjamin Farrington put it, “the emergence of a leisured class gives opportunity for reflection and elaboration of theory. It is also gives opportunity for reflection and elaboration of theory. It also gives opportunity for theorizing without relation to facts. Furthermore, with the development of classes, the need for a new kind of ‘science’ arises which might be defined as ‘the system of behavior by which man acquires mastery over man. When the task of mastering man becomes the preoccupation of the ruling class and the task of mastering nature becomes the forced labour of another class, science takes a new and dangerous turn” (Greek Science, Vol. I, p 15). What is true of science is true of philosophy also and both become tools in the hands of the ruling class to supplicate the working people. But this is not an absolute situation in favour of the ruling obscurantist and idealist thinkers. In the course of history, there have been many battles wages by the oppressed against the oppressors. If the oppressors developed a philosophy and reinforced it with the sanction and sanctity of law (called ‘dharmasastra’ in our context), the oppressed also developed a world outlook and worked out a scheme of things. Quite naturally, the oppressing class in its own interest suppressed this philosophy and even twisted it to suit its taste and design. This thick and gloomy cloud of darkness which has haunted philosophy, Indian philosophy included, needs to be wafted away before the cool fragrant breeze of philosophy can enliven the spirit of the working man. The deadweight in Indian philosophy must be discarded as dead and the sustaining values in it nourished as living. Vivisecting Indian philosophy from this crucial point of view is what Debiprasad Chattopadhyaya ably attempts and that is what makes What is Living and What is Dead in Indian Philosophy so relevant to our needs, and for the fulfillment of our cherished aspirations – the goal of shaping society in such a way that there is no possibility of man being exploited by man. The usual practice is to consider the different systems of Indian philosophy as theistic (astika) and atheistic (nastika) respectively. The atheistic systems are supposed to be those which do not recognize the validity of the Veda as the ultimate and infallible source of knowledge. The prime consideration of idealism and materialism as the distinguishing features of all systems of philosophy, including the Indian variety, is thus overlooked. So much so, quite an extraneous and irrelevant criterion, namely the authority of the Veda, has come to play the key role in the analysis of the characteristics and tenets of Indian philosophical systems. 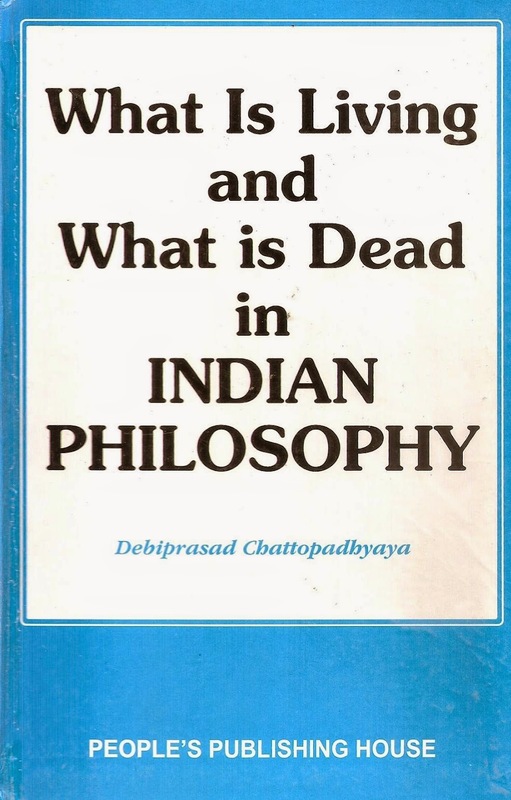 Chattopadhyaya, however, argues that the dichotomy between idealism and materialism is as much integral to Indian philosophy as to the philosophical thought of other countries. The recognition of the authority of the Veda by philosophers in Indian was not unoften the result of the powerful hold the law-givers had. Independent philosophical activity could not be carried on in an unstifled manner, thanks to the stranglehold of the law-givers. Even the classification of systems of philosophy as astika and nastika is the prescription of Manu, the supreme among law-givers. One of the remarkable success of Debiprasa’s book likes in the analysis he has provided of the role of the law givers in ancient Indian society. This he has for the first time brough out vividly by focusing attention on the fact that idealist philosophy was no more than a handmaid of the law-givers, many anti-idealist philosophers had to find their own ways of camouflaging. Al Biruni’s evidence in the context of Varahamihira and Brahmagupta, two eminent ancient Indian astronomers, extensively cited by Chattopadhyaya, brings out the rigours which the seekers after truth in ancient Indian had to face (pp. 257 ff). It might here be noted in passing that our own scientists are not under as much duress as their ancient counterparts were. And yet paradoxically enough they are more servile to orthodoxy and conservatism than, say, Brahmagupta. Even Kanda, the exponent of Vaisehika philosophy, had to hoodwink the orthodox bigots by his tricks before expounding his theory of atomism. The profuse lip sympathy he pays to Vedic orthodoxy and the occasional glorification of the priests and their privileges is what saves his theory from being crushed (pp. 262-63). Gotama, the author of the Nyaya Sutras, also cunningly does the same by allegedly repudiating the doubts concerning Vedic injunctions, while all the time suggesting the impossibility of Vedic authority being final (p.264). For these philosophers, truth is the product of observation and inference. Interrogation, analysis and reason are for them the genuine avenues leading to the knowledge of reality. They do not even remotely concern themselves with the doctrine propounded by the Upanishads which are usually regarded as the fountain of philosophical wisdom (p. 272). The idealist positions are thus thoroughly rejected by them. The contempt for the material world and logic is only one step behind social contempt for the toiling masses, and the Indian idealist philosophers reach that position very soon. Logic is wretched according to Mahabharata and Ramayana (pp 193-94), not to speak of Manu. Reason is dubious to Sankara (p 203). From this to the philosophy of denial of the world and rationalization of social parasitism is not a long way (p 135). Instead of encouraging the processes of knowledge as an answer to the real and puzzling problems of man, idealist philosophy only fosters faith as the lone solution. Fideism and irrationalism are, therefore, almost consciously nurtured by idealism (p 212). This approach has yet another significant impact. It leads to the decrying of manual labour and dissociation from nature. The latter in turn puts an end to interrogation and the attempt to understand nature. The class basis of philosophy thus gets shifted. This is best illustrated in the evolution of Buddhism, which began as a virile thrust against the priest-cult and ended up as the most rabid idealist philosophy (p 169). This is Part I of the essay first published in Marxist Miscellany, No.7, March 1977.